Regardless of one’s musical tastes, Lawrence University’s Kaleidoscope4 concert offers a musical buffet sure to satisfying the palates of even the pickiest of music lovers. The Lawrence Concert Choir, under the direction of conductor Stephen Sieck, performs from the balcony of the Fox Cities Performing Arts Center during the 2010 Kaleidscope concert. The fourth edition of Kaleidoscope, which showcases the musical talents of more than 300 Lawrence students, will be performed Saturday, Oct. 5 at 8 p.m. at the Fox Cities Performing Arts Center, 400 W. College Ave., Appleton. Tickets, at $15 for adults, $10 for senior citizens and $7 for students, are available at both the Lawrence University Box Office, 920-832-6749, and the Fox Cities Performing Arts Center Box Office, 920-730-3760. An encore presentation of Kaleidoscope4 will be broadcast on Wisconsin Public Television in early 2014. First performed in 2006, Kaleidoscope’s non-stop, 75-minute format provides a rapid-fire musical spectrum running the gamut from traditional Russian choral music to Latin orchestral rhythms to 11 bassoons churning out memorable Beatles classics. 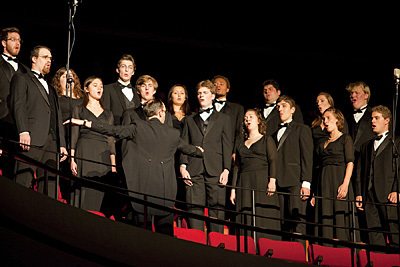 “Kaleidoscope is designed to showcase the broad variety and musical depth of our conservatory ensembles and chamber groups in an all-inclusive, musical extravaganza and this year’s performance promises to do just that,” said Phillip Swan, co-director of choral studies at Lawrence and the coordinator of this year’s concert. The most comprehensive music program Lawrence will present during the 2013-14 academic year, Kaleidoscope spotlights both large ensembles (Symphony Orchestra, Concert Choir, Gamelan Cahaya Asri, Wind Ensemble, Opera, Jazz Ensemble) and chamber groups (bassoon ensemble, voice/cello ensemble, string quartet, piano/oboe/viola, saxophone/marimba, piano duet). Providing a joyful exclamation mark on the evening will be an excerpt from the finale of Beethoven’s Ninth Symphony. Lawrence University gratefully acknowledges the Appleton Group for its sponsorship of the Kaleidoscope4 concert and extends its deep appreciation for its generous support of this special community arts showcase.